"My first memory of metalwork was watching my Great Uncle forging horseshoes in his blacksmithing workshop. Years later, at art school, I was taught how to solder and the obsession began." I, Sian, grew up in North Wales, surrounded by mountains and near the ocean. Water and nature has been a constant source of inspiration, and before jewellery found me, I sketched constantly. I feel that my small-town upbringing has influenced the way that I’ve built Bert Jewellery. I’m interested in everyone and love meeting people from every walk of life. It’s probably why I love creating personalised pieces. I studied Jewellery Design and Goldsmithing at Birmingham School of Jewellery, where I fell in love with the creation process. From the initial idea, and meaning behind a piece through to the creation. I loved learning how to solder, anneal, polish and set stones and spent three years perfecting these techniques. In 2009, along came Sydney, my biggest inspiration to date. Drawn to the climate, the coastlines and welcoming sense of community, I was quickly able to express myself and find constant inspiration from everything around me. I soon emigrated permanently, sponsored by a major jeweller, and quietly, gradually, alongside being a trade jeweller, I began the venture that has become Bert. Bondi Beach and Clarence St, Sydney. Bert was initially started in Sian’s tiny Bondi studio, yet is now based at her workshop in the heart of the city. All pieces draw influence from Bert’s diverse background (she’s half American, half Welsh, has lived in West Africa, the UK and Australia), her extensive travels, encounters, coastal surroundings and respect for nature. All diamonds and gemstones sourced are conflict-free and ethically derived. The ring boxes? They’re custom made, on a small-scale, and manufactured from highly sustainable Australian Jarrah in New Zealand. It's this attention to every detail, as well as the personalised approach, that keeps Bert’s customers consistently recommending Bert Jewellery (https://www.bertjewellery.com/testimonials/ ) to those embarking on their own custom-made jewellery experience. We meet, we talk, I sketch, we bounce ideas, we agree on a starting point. Bert does the rest. You'll receive further ideas, often via email, quote options, and when you're happy, we commence creating your perfect ring. It's as simple as that. 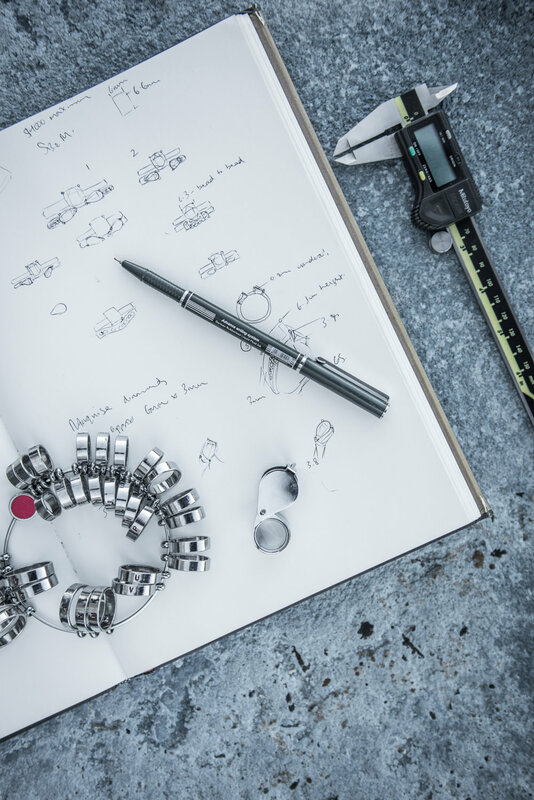 Transparency is the most important aspect of Bert Jewellery, so you will work closely with Bert throughout the design process - from initial sketches right through to completion. We'll never try to push your budget higher or create a ring that you don't feel as excited about as we do.